Today the Media Services team announced updates to the “classic” portal experience to improve encoding speed, format support and stability. In addition, we are changing the names of our Encoding Reserved Units to eliminate confusion between encoders and encoding speed. Encoding Reserved Units are often confused with the actual Encoder due to the duplicate use of the names “Standard” and “Premium.” Based on customer feedback, we wanted to reduce the confusion and a happy side-effect of this is that it provides us a simpler naming model to expand and support faster speeds in the future. 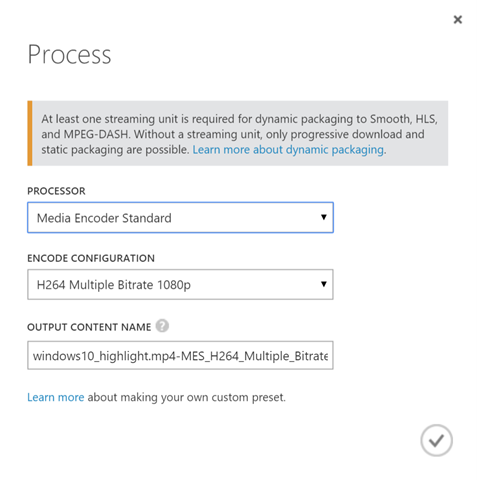 This past July we launched the new and improved Media Encoder Standard. This encoder was built to replace the current “Azure Media Encoder” – providing a more stable encoder with faster performance, a wider codec library, and easier extensibility for the future. It built on a newer and more extensible pipeline – making it easier on our team to expand on feature quickly. Users of the PaaS services and Azure Media Services Explorer Tool are likely already familiar with the capabilities of this new encoder, and the team is now pleased to add the capabilities of this encoder to the portal. The portal has now been updated to include the new presets that ship with Media Encoder Standard. All the “system” presets introduced in Media Encoder Standard can be found here. Keep in mind that you can still create your own custom presets using JSON or XML and submit your encoding jobs via the REST API, .NET and JAVA SDKs, or the Azure Media Services Explorer Tool. Based on customer feedback, we are renaming the encoding reserved unit type to reduce confusion and provide for future expansion of new speeds. What are today Basic, Standard, and Premium Encoding Reserved Units will be renamed to S1, S2, and S3 Media Reserved Units, respectively. Customers using Basic Encoding RUs today will see S1 as the label in Azure Portal (and in the bill), while Standard and Premium will see the labels S2 and S3 respectively. There will be no changes to the product at this time, but this naming structure will allow us to expand and offer additional speed choices in the future. Please visit the Media Services Pricing Page for more information. The new names were chosen to align with other Azure services, and also reflect the “speed” level of encoding. S1 is our slowest speed, while S3 is now our fastest encoding speed (typically 1x real-time or better depending on your source and encoding preset). In the portal, this will be automatically reflected in the “Reserved Capacity” section. For example, if you currently have the Standard encoding reserved unit type, it will now show as S2. As usual, feedback is very welcome. The team monitors feedback on our MSDN Forum and StackOverflow. Please submit any new feature requests on our UserVoice page.